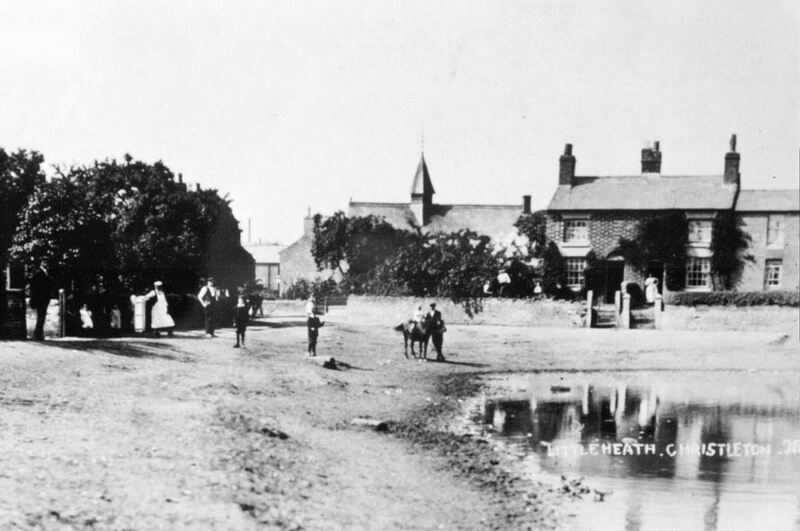 The origins of the pit at Little Heath date back to at least 1711 when Gerard Townsend a Merchant of Chester (Ironmonger), who had purchased the Old Hall, built "a pond for fish", enlarging a pond on land belonging to the then Lord of the Manor, Sir Henry Harpur of Calke Abbey in Derbyshire. Evidence for this comes from a case at Chester Assizes in 1772 when Robert Townsend, Gerard's son and heir was prosecuted for not paying tax to the Lord of the Manor of Christleton for the pond on his land, for over 50 years. The case involving "a pond for fish" at Little Heath was a very long drawn out affair, but it appears that Robert Townsend won the argument in court. 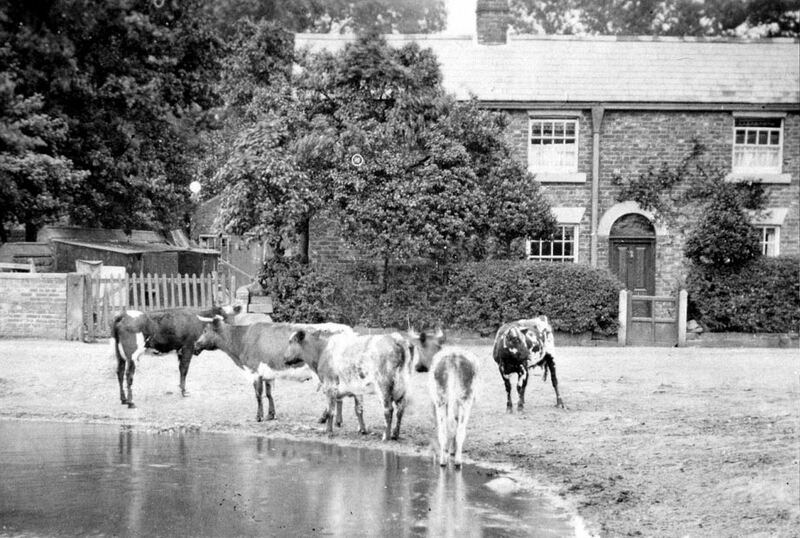 The pond was on an area of land, even then described as "common land", land that the people of Christleton had a right to use for grazing and watering their animals, a place to roam freely. The area around Little Heath was the source of a number of minerals suitable for extraction, and used in many ways in village life. The village of Christleton is built on top of beds of Old Red Sandstone rock dating from about 300 million years ago, and there are several places in the village where this sandstone can be seen. The main quarry in Quarry Lane which was at its deepest adjacent to the canal provided a large amount of good workable sandstone, useful for both walls and building stone for houses, many of which are still standing today. When the excavation of the A55 extension was taking place near the Rugby club at Littleton, the hard sandstone was found to be covered by sand, to the depth of almost 50 metres. The centre of Christleton is in effect, built on an island of sandstone projecting above a "sea" of clay and soft sand which is very deep in many places. During the last great ice age, glaciers covered the area and brought with them thousands of tons of boulder clay and debris of volcanic rocks from the Lake District and North Wales. The Cheshire Plain itself was carved out by these glaciers and evidence of this can be seen from any high point overlooking the area. Most farmland in and around Christleton contains some evidence of the deposits of both clay and these erratic rocks, and one such granite boulder has been left at the side of the Pit near Old Pits Farm for people to see. Hundreds of marl pits still remain in the Parish as evidence of where the clay was best for marling. 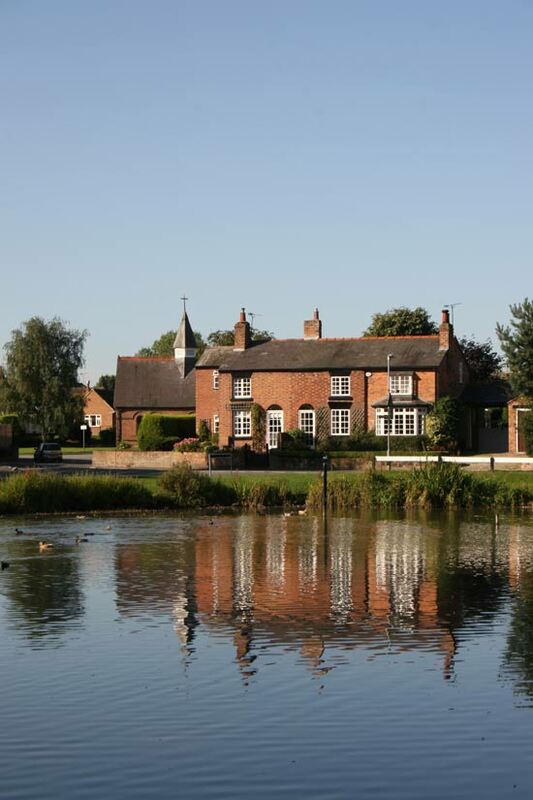 Although we have lost many of these pits in the last fifty years, Christleton can still be described as the pond capital of Cheshire from the density of the ponds that remain. In the 1980's a borehole survey was carried out by Geoff Clifton from Gifford & Partners. This showed that the depth of clay at the pit varies from a few centimetres to many metres. The ground typically appears to be 1m of fill (silt and clay) over a thin lens of sand, below which is 1m of clay, and below that 75cm of dry sand all lying on top of the sandstone bedrock. In another core hole we find that just over 3m down there is evidence of gravel which would have been ideal for road making by the local Highways Committee, which in the 1800's was the responsibility of the village itself. Villagers from early times discovered the wealth of material available to them at the Pit. There were pockets of sand for use of the building trade, areas of gravel and rough stones to be used for road making, a deep red clay to make bricks, and a grey clay/marl which could improve the quality of local fields by adding body to the sandy structure and providing an in built fertiliser from the lime content within it. When the children of the Primary School began work on the Pit in the mid 1970's they found evidence of a brick kiln where local hand made bricks, more variable in size and shape than today's bricks, were made and fired. The bricks can be seen in many of the older cottages and walls around the village date from around 1700 when much rebuilding of the village took place, following its destruction during the Civil War in 1645. The name "Bricky Lane" is given to the lane to the north side of the Pit, indicating strongly that there was a brick kiln there. We also discovered that Christleton bricks were very expensive, and in a document at the Cheshire County Record Office found an order for 73,000 bricks from Christleton. At 9s 2d per 1000, these were more than twice as expensive as bricks from other local sources. There were several other clay pits and brick kilns in the parish, the most interesting, being the pit at Cotton Edmunds belonging to the Westminster Estate. 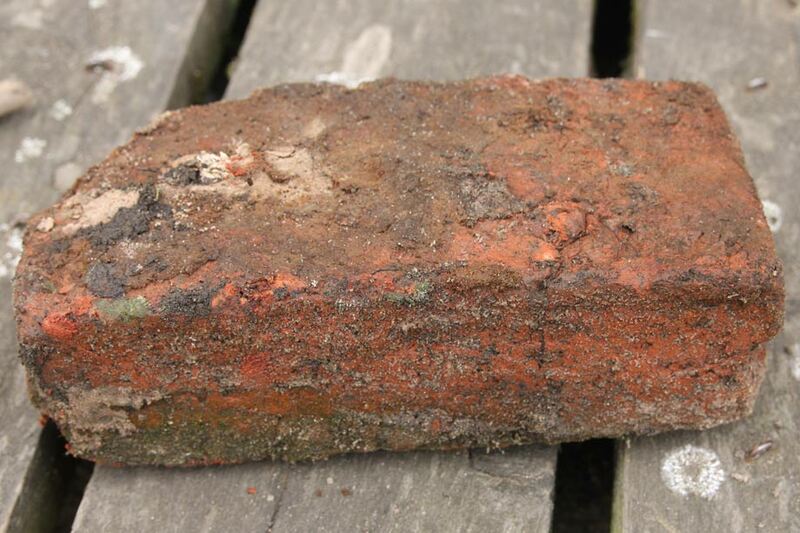 The technique for making bricks started with clay being dug in the autumn and left to weather and break up. In spring it was mixed together with spades, and trodden down to remove stones and impurities, then moulded, dried in sheds, and fired in wood or coal fired kilns. In all there were probably five or even six individual pits at Little Heath each with their particular materials or aggregates, and as the years progressed each gradually filled with water, and became a source of water for both animals and the village population. Several of these pits were extensive, and others were used to dump rubbish that had accumulated from the village. This seems to have been a particularly extensive practice in Victorian times as we found lots of bottles, broken pottery and other artefacts when clearing the area in 1974. When the commercial activities at the pit ceased, the pits themselves rapidly filled with water, becoming wonderful habitats for wildlife. The majority of people visiting the Pit have no idea that the only source of water to it comes from rainwater, and from several road drains along Little Heath Road. There have been many times in the history of the village that the Pit has dried up, and caused concern. In 1893 Canon Garnett writing in the Parish Magazine, describes "the Pit is becoming a problem", and in 1896 the minutes of the newly formed Parish Council state, "that the Pit has dried up and something needs to be done about it". This situation has occurred again at least four times during the 20th C, but thanks to the efforts of the Parish Council and Pit Group volunteers, the area is now well reasonably well maintained, but still depends on a steady supply of rainwater to fill it. The last three dry periods were in 1969, when the Parish Council won a County Council Award for their Conservation efforts. In 1975/6 when the Primary School children were involved, and then in 2011 when the driest weather for over thirty years has seen the Pit become a desert in parts with much of the shallower area of land returning to a dry sandy base which has now re-colonised with plants and marsh vegetation. The key to the rapid change of fortunes can be found in the weather patterns for particular years. Little Heath Pit depends on having sufficient rainfall to keep it full. The larger the area of open water the more evaporation that takes place, and emergent plants with roots in the water, such as bulrush and yellow flag in turn absorb considerable quantities of water. It's also estimated for example that a single willow tree absorbs 4000 litres of water per year through its roots, and we had at least thirty willow trees in the pit ! One solution was to remove some of the willows, and cut down the branch growth from time to time. This was successful in helping to retain a good water level until the drought of 2011. However some of these older stunted willows have now died of old age and have not been replaced naturally. Long spells of warm weather can cause major problems and it's calculated that in a very sunny week in summer 5cm or two inches of water can be evaporated by the sun, and even more soaked up through the plants and aquatic vegetation. Smaller ponds protected by overhanging trees, and covered by pondweed or floating grass don't have such a problem. Ponds everywhere also suffer from a build up of silt from rotting vegetation, which accumulates after a time, and need clearing. e.g. The major London Park ponds need draining about every fifteen years to remove such silt, and Little Heath Pit being a pond with no direct flow or stream outlet, has similar problems. The latest project for the removal of silt from the Pit took place in 2007/2008 and was funded by Wren U.K. and carried out by the Blue Boar Company. Tons of silt were removed by miniature floating cranes, and poured into barges. This material was then taken to the side of the pit, unloaded into road trailers and hauled by tractor and spread over large areas of surrounding farmland, work carried out by Stuart Arden & Co. who have given great assistance to the Pit Project for many years. Another factor concerning the level of water in the Pit is that water run- off from nearby farm fields, which was once of great benefit to the main pond has largely ceased due to changes in agricultural practices since the 1970’s. In 1989 during our search for a constant source of water, we followed the advice from older members of the community who were convinced that a "spring" in the area of the Alms Houses had provided water for the pit in the past. However the bubbling source of water, we found when exploring that marshy area with divining rods, proved to be a from a leaking mains water pipe 20m away. The water which flowed for seven years from this " spring", gave a regular volume of approx. 400 litres per hour, and kept the water level high. However it was lost when the leak was finally discovered and repaired. The change in vegetation due to the influx of “mains water” was quite dramatic, with bulrushes dying due to the influx of the fluoridated water, whilst yellow flag iris plants really flourished. Marl a clay containing a good proportion of lime, is associated with areas of boulder clay and was usually dug out and spread on farmland after the autumn ploughing. The effects of marling the land lasted for up to twelve years, and in 1740 it's recorded that there were over 280 marl pits in Christleton Parish alone. Virtually every field had its own special pit, and occasionally two pits would be found on adjacent sides of a hedge, with the marlers taking advantage of the same deposit of clay. 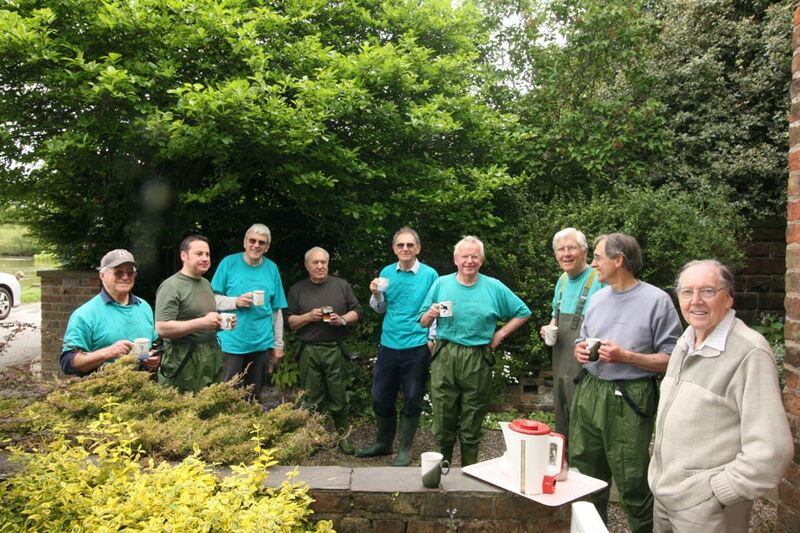 Teams of marlers travelled the county to work the pits. Once marl had been established by drilling with an auger, a team of four hewers and four fillers would open up the pit. The marl would then be transported by cart to where it was needed, and put down on the ground by the spreaders. It took about five days to cover an acre at a cost of £12, but £20 if bad weather caused delays. The carters were paid 20s a week plus 4s a week to feed their horses, and the marlers 14s a week. The marlers' meagre pay was supplemented by money earned in entertaining villagers in the evenings in the local pubs. They had a folklore and culture of their own, with many marling poems, songs and dances. Village festivals often occurred when the marlers were present, and their special finishing day was celebrated in grand style with Maypole and Sword Dancing and even Bear Baiting in some villages. A typical local bear pit can still be seen at Church Lane, at Upton by Chester. The Marlers would wear colourful headresses, and dance with the local girls who themselves would have been gaily dressed, and with garlands of fresh flowers in their hair. By 1890 there were two large areas of water connected by a causeway, with the area extended by Robert Townsend as a pond for fish being one of them. Fish of course would have been a valuable addition to the food supply available to villagers, and they were also able to make use of the ice which formed in the winter to stock up the Ice House which existed near the present main entrance to the High School in an area of the Village known as "The Bottom of the Wood". These fish ponds were relatively common throughout the country, as fish was a good source of protein for the community. Roach, rudd, perch, tench, crucian and common carp can all be found in good numbers at the Pit and maybe derive from the earlier populations released and kept for food there. 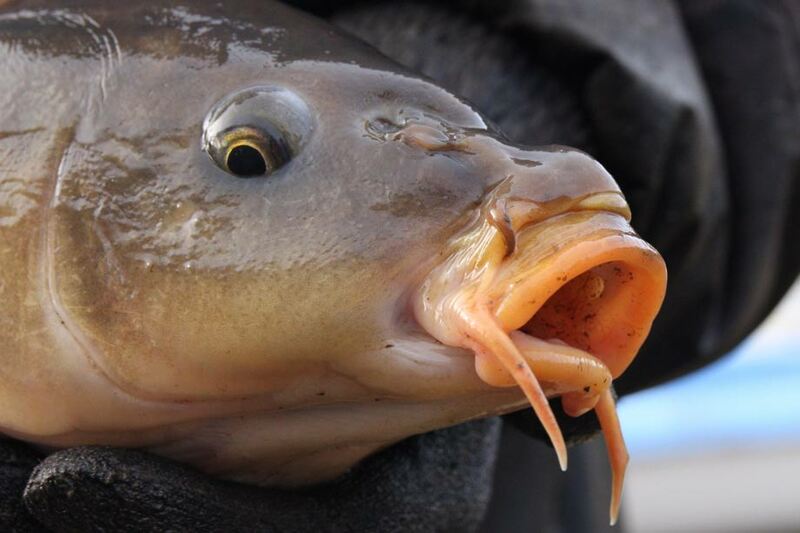 The release into the Pit of a large orange fan tailed fish has crossed with a crucian carp, giving a new species of fish for the British Isles. Where this fish came from is anyone's guess, but it was probably a fish that grew too big for a fish tank or garden pond. It is illegal to release any non native species into the wild. Considering the pit had dried out completely in 1975/6, it is amazing that such a large population of fish exists, but shows what good growing conditions there are at the Pit for such species. Fishing at the Pit is restricted to young people from the Parish, who are allowed to fish from specially constructed platforms, on the north side during the fishing season, so protecting the fish stocks but also ensuring the surrounding environment of the Pit is not damaged, and can be used for other purposes by the local community. 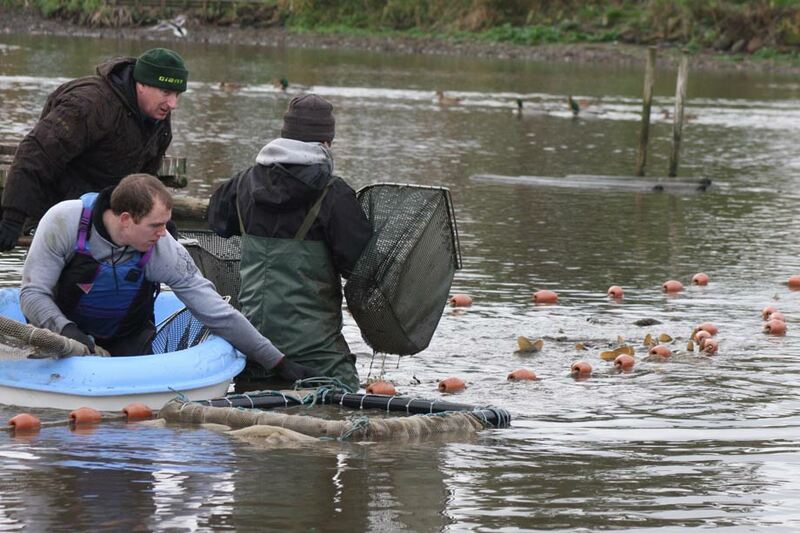 2011 saw the removal by netting of over 200 large fish weighing between 15 and 20lbs by Warrington Anglers. The largest caught at the Pit, a common carp is said to have weighed 23 1/2lbs, and everyone who saw the catch were amazed by the size and quantity of the fish caught mainly common, crucian and mirror carp with some bream. 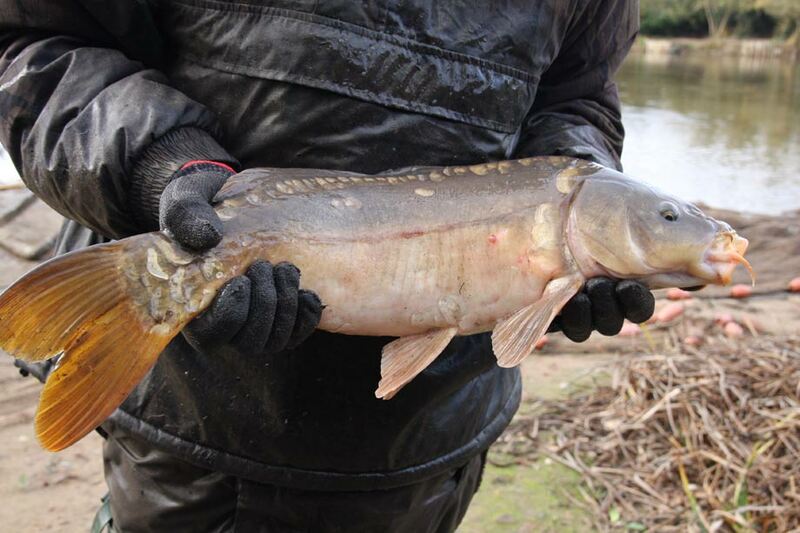 They were taken in huge portable tanks to a large pond at Buckley, giving them a better chance of survival from the lack of water remaining in the Pit, but also to remove some of the illegal fishing by adult fishermen which has taken place often at night, causing a major source of nuisance to the residents in the area. The orange fan tailed fish mentioned above was caught in the nets during the recent catch but escaped once more into the depths of the Pit, to remain for future generations to see.! There is a very long tradition of there being a family of swans at the Pit. It's possible that this might go back hundreds of years as the "Pelican", part of the former reredos at St James Church which was made before 1737, actually appears to be a swan. Perhaps the craftsman responsible for this figure representing mother church feeding its young, had seen swans locally, but not a pelican. Also the deeds of the new church building in 1736 contain the signatures of all the church -wardens, clergy and local gentry each name appearing to be sealed with the stamp of a swan. Later the Reverend A A Guest Williams uses a swan emblem as part of his family crest. However it's in more recent times that swans have been known to nest at the Pit. 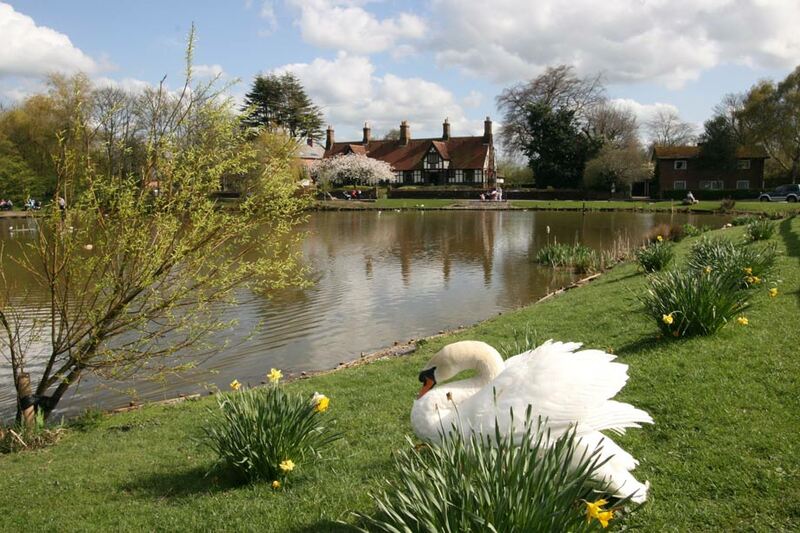 Photographs from the 1960's and early 70's clearly show the nest site at the back of the Pit in an area of thick reeds and bulrush, and villagers delight in telling the story and showing photographs of swans and cygnets walking through the village holding up the traffic. 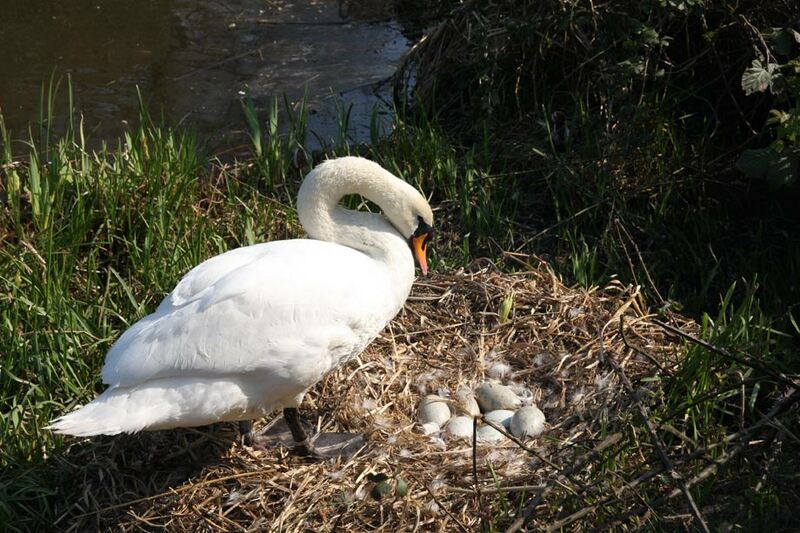 However following the illegal shooting of the female on the nest site in 1973, the male left the area and swans didn't return to nest site until the winter of 1989. The return followed the successful restoration of the pit, and the return of a good water level. 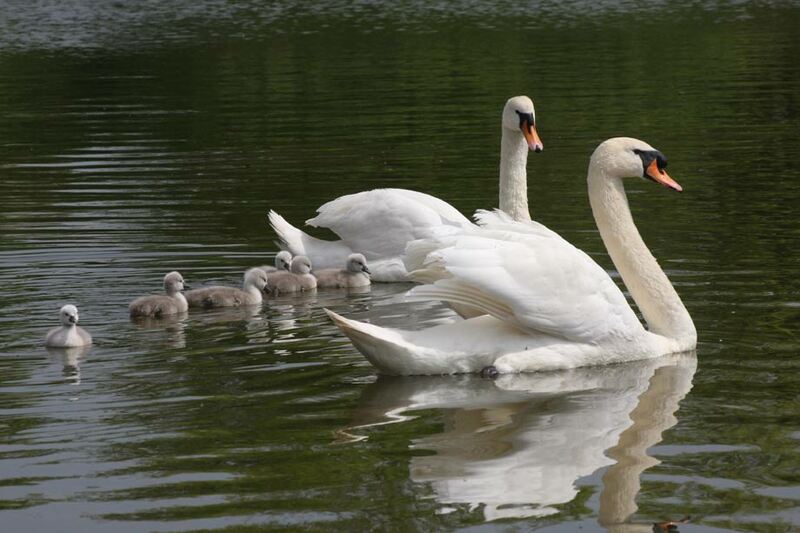 The pair of swans concerned were ringed as part of a national project & given unique references of 2SD & 2SL, and over the following seven years they produced 49 eggs and successfully hatched 44 cygnets. 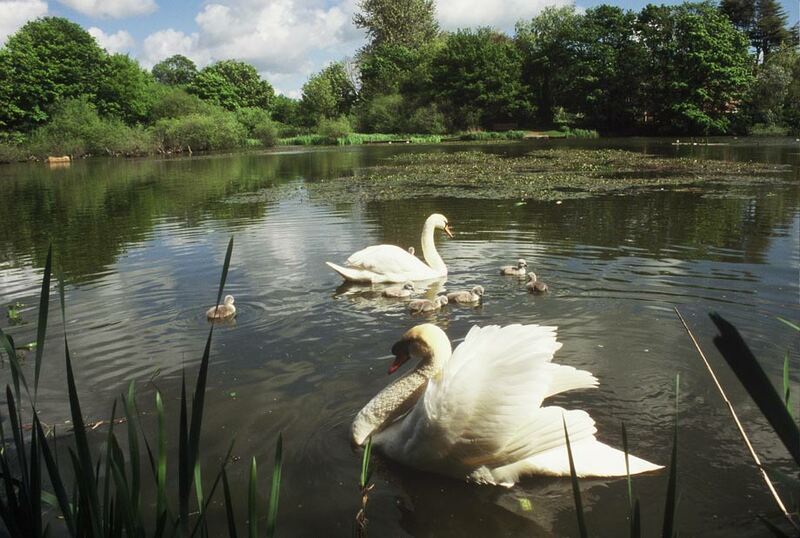 Following the death of the cob 2SL in 1996, a new pair VZN and TOV (a cygnet of the original pair) took over the territory and have produced 74eggs and hatched 65cygnets. 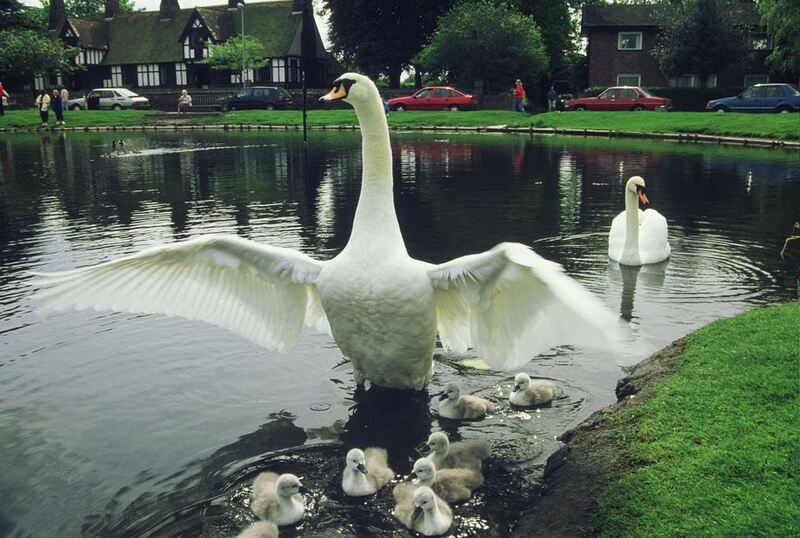 Since 1989 143 eggs have been laid and 125 cygnets born, with 101 surviving to fly in the September of their birth year, a wonderful record and one of the most productive pairs recorded in the UK. Our swans have brought great pleasure to people over the years and everyone is disappointed to see them leave the pit for the canal after such a short time each year, but lack of food in and around the Pit is clearly a major cause. 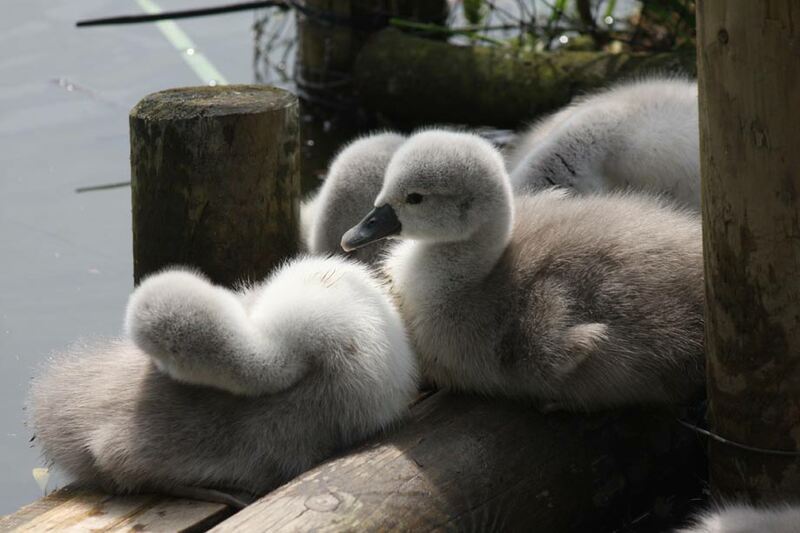 The majority of our cygnets have been ringed by members of the Cheshire Swan Study Group, and because of this, many sightings and recoveries of the birds have been made and we've been able to plot their progress throughout the country. In the early 1990's most of the birds seem to have flown south, following the canal system and the River Severn, sometimes calling in at Tattenhall Fisheries, before being seen in Kidderminster and Gloucester Later we find them visiting the Dee at Farndon and on to the lake at Ellesmere. Christleton cygnets have appeared on the Groves, and then flown along the Dee and Welsh Coast to Rhyl Marine Lake, Conway, Bangor, the Menai Straits and Caernarvon. On another occasion a cygnet was rescued covered in slimy black oil after an oil spill on the Mersey, and released back there after being cleaned up at the RSPCA Centre in Nantwich. 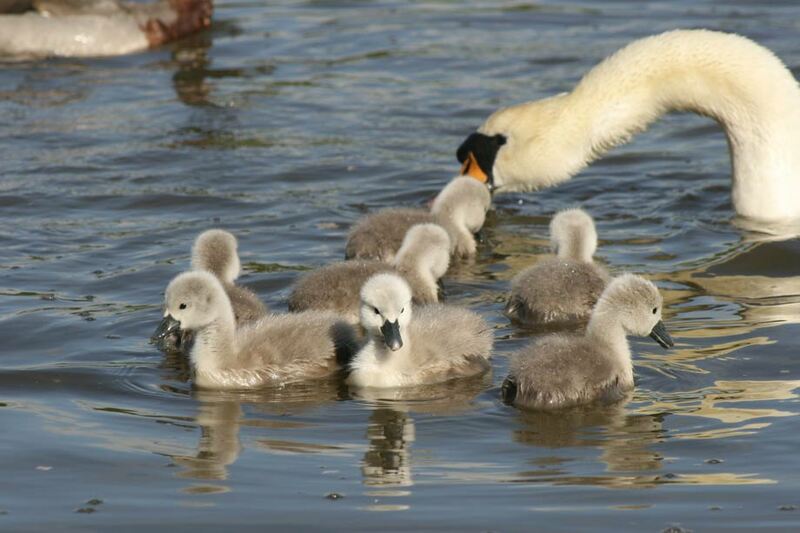 Other cygnets have visited Kingsway Bridge in Warrington, Spike Island Widnes, Fiddlers Ferry Power Station and Southport Marine Lake, Shrewsbury, Telford, Bewdley and Kidderminster on the River Severn, and even one at Slimbridge in Gloucestershire. 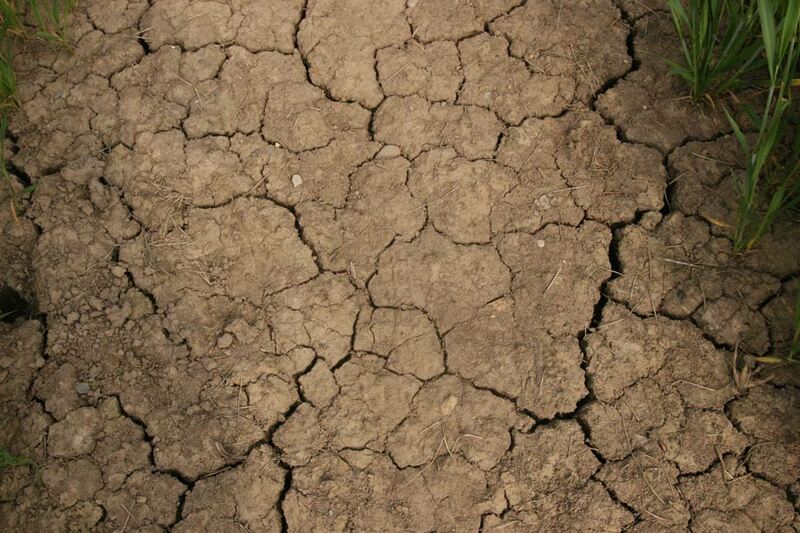 Most villagers are aware of the problems that can occur at The Pit due to silting and periods of drought. When the last really dry period occurred in 1975/6 there was talk of "filling it in to make a football pitch". 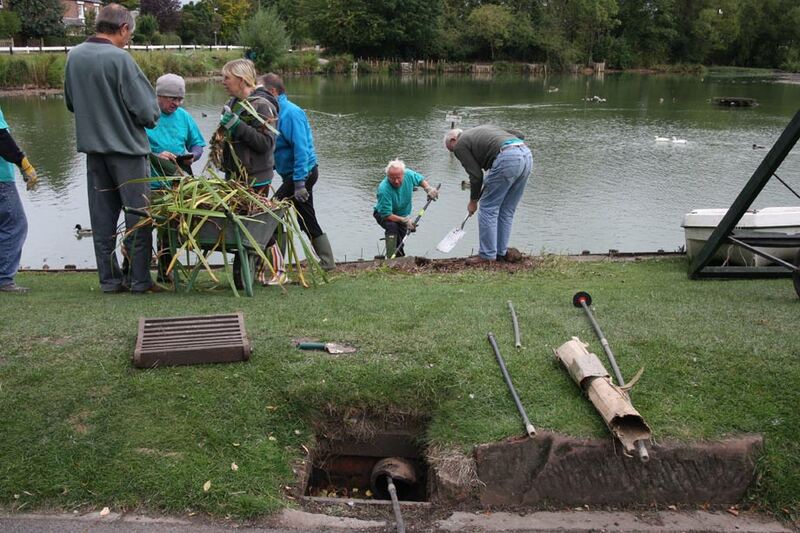 However several people including myself went to the Parish Council to ask for help in restoring the area as a pond. 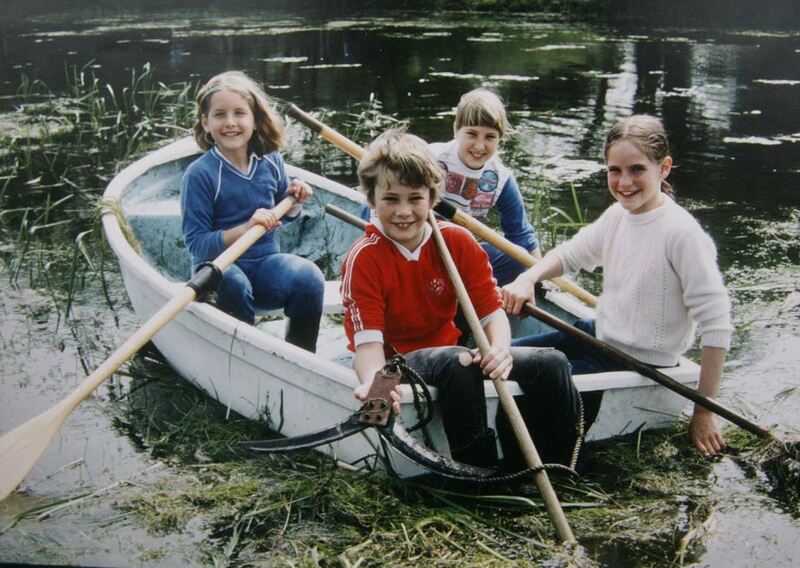 The Council agreed and a pond rescue was attempted in the summer of 1976. This was not the first time such efforts have had to be made. There are many references to the "Pit causing problems again" and drying out between 1895 and the 1960's. Thomas Mayers was contracted by the Parish Council to clear the pit around about the time of the first world war, and in 1969 men from the village sprayed the pit with chemicals to get rid of the water horse tails which had choked the whole surface area. This scheme proved to be a success, in fact won a Cheshire County Council Conservation Award, and the pit remained full of water until the mid 1970's when several very dry summers caused the major problem. 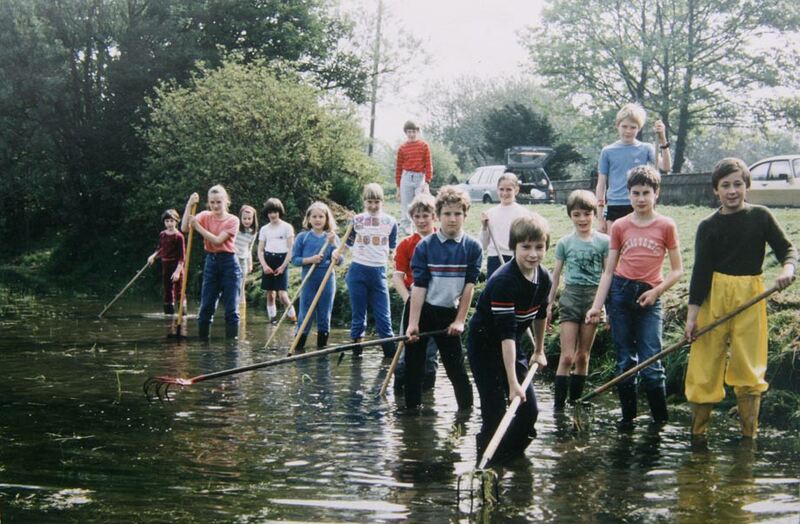 I became involved in conservation work in the village in 1972, when Barbara Redwood and Anthea Brian contacted me as the new Headteacher of the Primary School to allow pupils from the school to become involved in their environmental survey. The Redwood/ Brian survey is still a model for others to follow, and is probably one of the most detailed environmental studies of any village yet carried out. The children helped by collecting information about plants, trees, birds, butterflies and animals, and then surveying, mapping and later making a scale model of the pit. In 1974 their work was displayed in Gamul House in Chester, and the completed Parish Survey was exhibited at the Primary School, and visited by Gerald the new Duke of Westminster who showed great interest in our work. 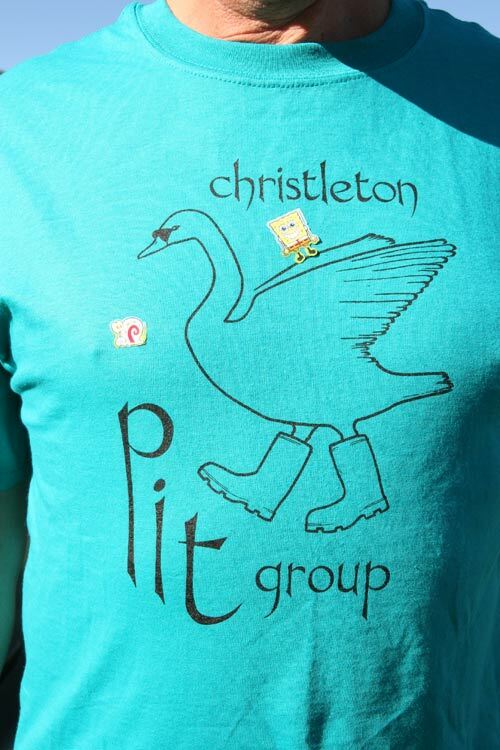 At about the same time there was a National Campaign to "Save the Village Pond", and a project book about the Pit in Christleton was submitted as an entry by the school. 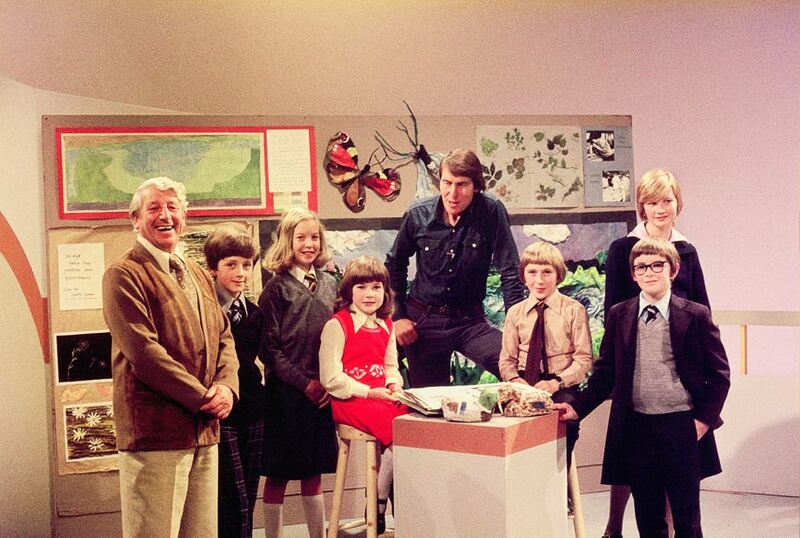 We were delighted to hear that the project had won second place and that a group of our children were invited to appear on the BBC TV Programme "Animal Magic" with the legendary Johnny Morris and Tony Soper. The programme went out live each week from the studios in Bristol, and four excited children went down to the studios for the event. This of course highlighted the work being done, not only by the written project, but in the practical clearing of the litter around the pit, and in keeping the vegetation around the perimeter under control. The crunch time for the Pit came after the two very dry summers of 1975 and 76. By the mid summer of 1976 the pit resembled the surface of the Arizona Desert, with large cracks all over the dried out surface and there was virtually no water or even mud to be seen. The "Private Water" notice at the edge to deter fishermen became a huge local joke, but concern about the future of the area was real. 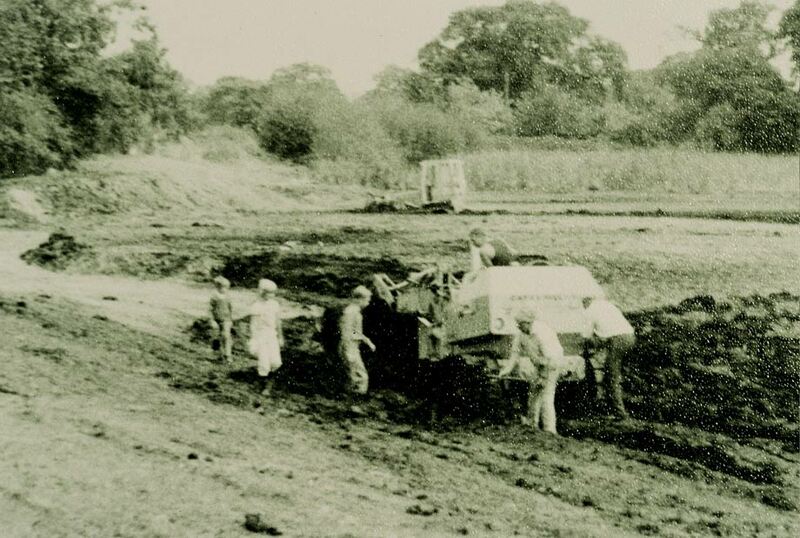 With the support of Bowater Paper Corporation, the Parish Council arranged for a small tracked vehicle to try to excavate the silt and mud from the pit area. 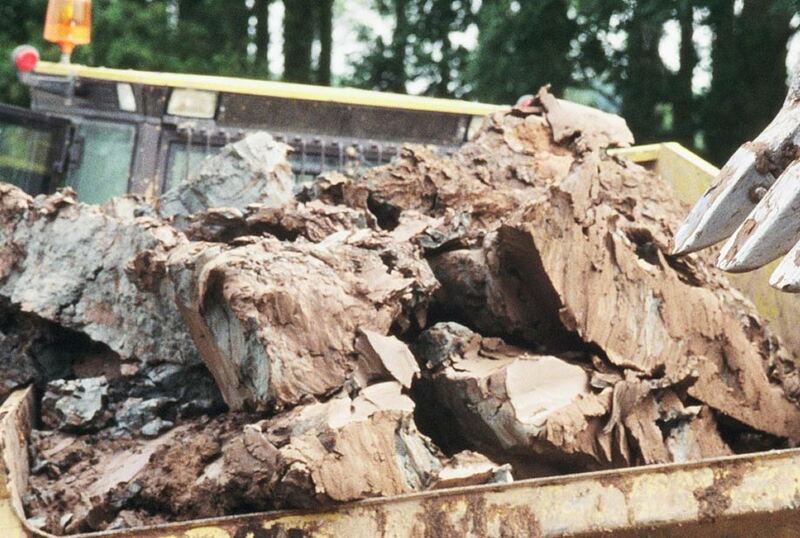 Unfortunately although the crust appeared to be hard and dry, the surface collapsed in parts as the vehicle tracked over it, and after a few hours of attempted clearance the vehicle was firmly stuck in an area of thick boulder clay. The loan of a machine for a morning became three days, as a second tracked vehicle also became stuck trying to rescue the first, and both had to be dug out largely by hand. The initial work of the first vehicle had however cleared a channel around the outside of the pit and this proved to be very valuable in creating space for a deep trough of water for future years. Thankfully the Autumn and Winter of 1976 proved to be very wet indeed and the deep channel around the outer edge rapidly filled with water, and even the central surface area was submerged. This deep channel has proved to be the saving of the pit and even today in 2011/12 is still is over a metre deep, always holding water whatever the weather conditions have been. 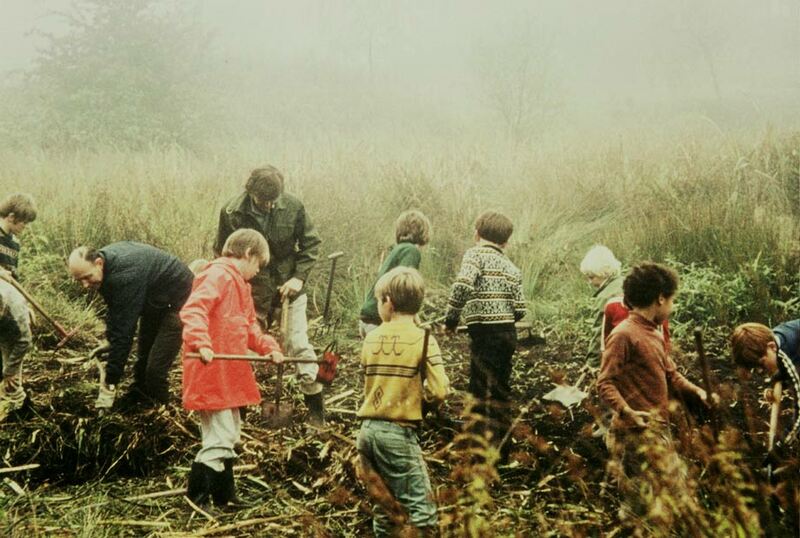 In the mid 1970's the Primary School children and several parents began to meet each week to carry out work at the Pit, and this project grew to involve hundreds of children who worked on Friday evenings and Saturday mornings through spring, early summer and autumn. The children were enthusiastic and they had the wonderful excuse of getting covered in mud with no one ever grumbling at them, because they were working to conserve their local environment. What today's health & safety rules would say of the way the children worked and the tools they worked with I'd hate to think, but these were special days, and we were very proud of the efforts and the contribution to the cause that the children made over many years. The children regularly made the local press with their achievements, and a book for children about British Wildlife and the Environment published by Hamlyn included a chapter about their work at the Pit. Further articles appeared in the annual report of the North West Civic Trust, and in magazines of the Conservation Trusts. Later articles appeared in the Methodist Church /Home Magazine, and the children's work was nominated for awards by the RSPB, the Wildfowl & Wetland Trust, and Cheshire County Council's first Environmental Award Scheme for Schools. However despite their enthusiastic efforts the central area began reverting to being a swamp, and further more drastic action was needed. The Pit Group was formed in 1988 under the Chairmanship of John Salter, with Eric Kenyon, Ian Gorst, Derek Bell, Tony Gardner, Phil Haywood, Gerry Crees, Charles Smeatham and David Cummings among others as committee members. The first working parties met on the 1st & 8th October in that year, with the intention of making sure that the pit was restored for the future enjoyment of the village community. There was again immediate support from the Parish Council, both financially and of a practical nature. Plans for the long term future of the Pit were drawn up based on the limited knowledge that we had acquired over the years. 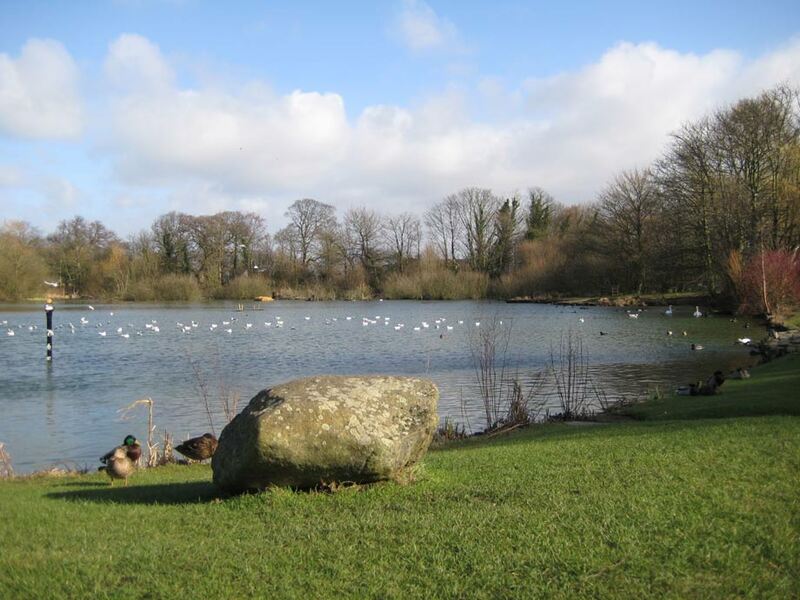 We sought advice from organisations such as the Conservation Trusts and the then Nature Conservancy Council, but no one had tackled the problems we faced with such a large area of water, over 2 acres in fact. With the days of the old traction engines that cleared such ponds with drag lines long gone, no one it seemed had the technology we needed for such a difficult task. One of the first decisions was to decide what the problem really was. Did the geology of the area affect the water level? Could we get an additional source of water from nearby? At this stage Gifford & Partners provided the borehole survey, which indicated to us the various depths of clay, silt and sand in the pit area, and from this we devised our action plan. a. to clear areas of vegetation to enable a good surface area of water to be seen by the public, and used by wildlife. b. to retain the area at the back of the pit as a secluded wildlife reserve. 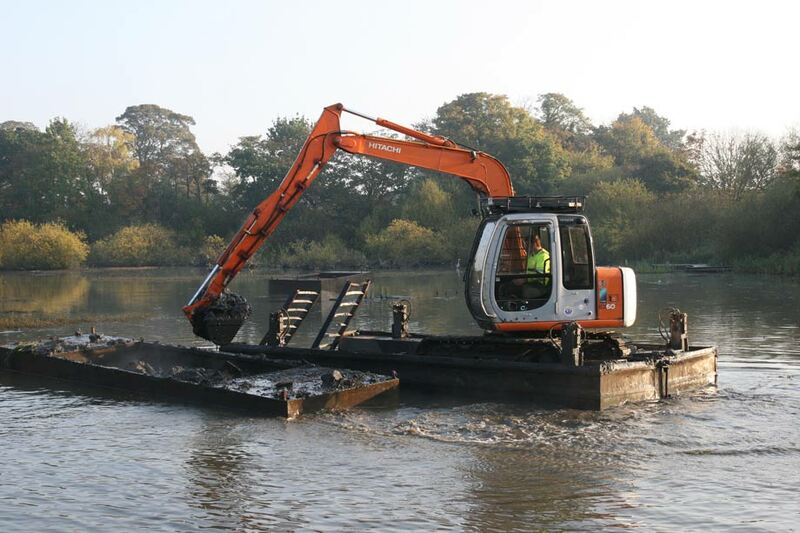 c. to remove some of the accumulated silt and mud. d. to create a new & safe pond edge to prevent erosion and act as a natural barrier. e. to create additional areas of seating for the public. Since then many other challenges have emerged, but we have always kept to the basic principle that the pit has to be a place of importance for wildlife, and a valued amenity and place of enjoyment for as many sections of the community as possible. Over the years fishing and pond dipping platforms have been built, seats provided, a sandstone buffer provide to prevent erosion of the banks, a silt trap to prevent surface oil from the road reaching the water, and a swans' nest site has been erected. 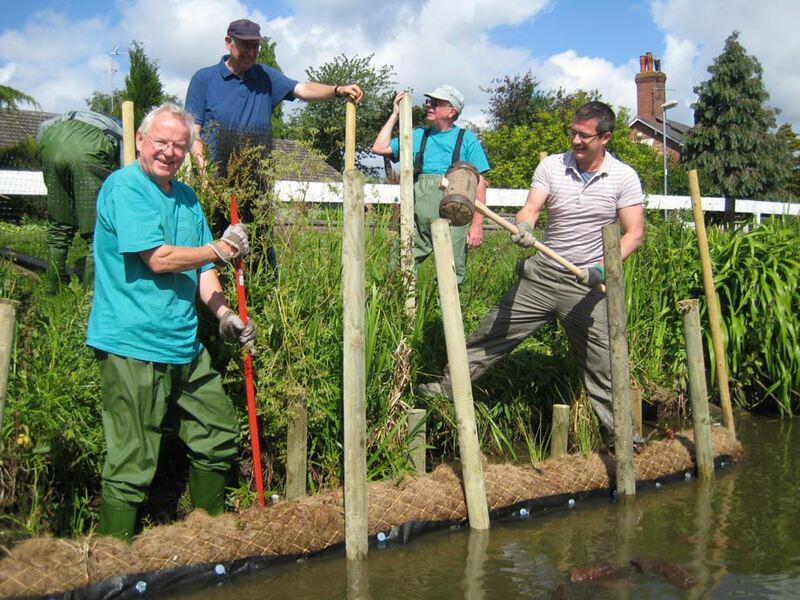 In 2009/10 coir rolls containing imbedded native plant species have been added to the banks to help stabilise them, and prevent further water erosion. All these objectives have been met, often using recycled materials from old telegraph poles, discarded curbstones to slabs of unwanted paving stone. Team members have had to learn new skills to use these materials, but we have always been fortunate enough to have members with enthusiasm and commitment to the work to turn up whenever work is required. There has also been the wonderful support of other members of the community, not only in providing financial support in our fund raising, but vehicles, tools and equipment when needed. The Arden Family are foremost among them with the regular loan of equipment, and from our link with them through the Parish Council and the late Jim Partington & Phil Haywood. We have also benefited from the help and support of the Dandy Family of Littleton, and Eric & Brian Beech from Brown Heath Farm. We would also have been lost without the special help of Shell U.K. with their most generous support of workshop space for the development of equipment, especially the "Drag Queen", and loan of expensive cranes and lifting tackle when needed. Shell also arranged the loan of an enormous crane from Ainscough’s which lifted complete trees out of the Pit for us!. Our link with Shell was through Ian Gorst our Chairman who has been the inspiration in providing solutions to our most difficult problems. We have also benefited enormously from having the artistic and creative skills of Eric Kenyon. Eric provides the drawings and plans that we work to, and has now become an expert in pond conservation, and is recognised as such by the Heritage Ponds Group. The "drag queen" mentioned was not a medieval torture, but an ingenious device for dragging along the bottom of the pond removing unwanted rhizomes and reeds without damaging the ponds base. It looked rather like a supermarket trolley mounted on a sledge, which was attached to a long hawser and towed through the water, itself pulled by the long jib of a crane. This device guided by Ian and others in wet suits was instrumental in clearing the heavy matting of material that had accumulated very rapidly in the central area of the pit in the years between 1976 and 1986. The material was removed from the central area by boat and canoe, taken to the side of the pit where it was removed by other members, and deposited on areas of farmland or burned. The contribution by Shell is recognised by the Shell Logo on the top of the water depth posts on either side of the pit. Each year working parties are organised to clear or maintain certain aspects of the pit, and all the improvements have created what is accepted as an excellent amenity for the village, creating a balance between the needs of the natural world and the community. Future work will be undertaken only when absolutely necessary, so as not to disturb the pond, plant and wildlife community. When the pond conservation work started we were almost working in the dark, and perhaps in hindsight have done some things that might have caused more harm than it should, the removal of large stands of bulrush, combined with the introduction (unknown to us at the time), of fluoridated tap water killed off virtually the whole community of plants and thousands of pond creatures. This created a beautiful pond, but it was devoid of important elements, e.g. plants vital for the growth of insects and home to many aquatic creatures. 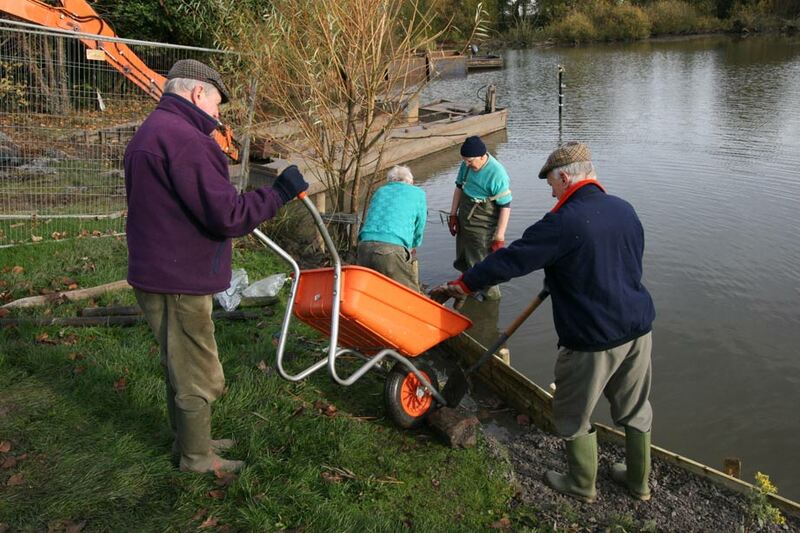 Although we looked for advice from national organisations at the time decisions were taken, virtually none was available, but thanks to the Heritage Ponds Project and the work of Penny Williams, Jeremy Biggs and others from Oxford Brookes University, there is now a bank of knowledge available to pond rescuers in the future. 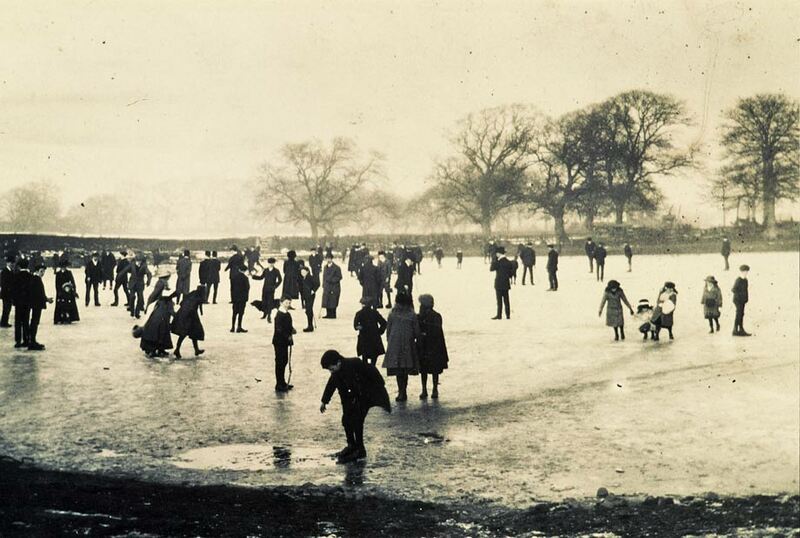 Our involvement with the Heritage Pond Project was a direct result of our project being nominated by Dr Andrew Hull of John Moore’s University in Liverpool as a Heritage Pond for the North of England for the Millennium Pond Project. 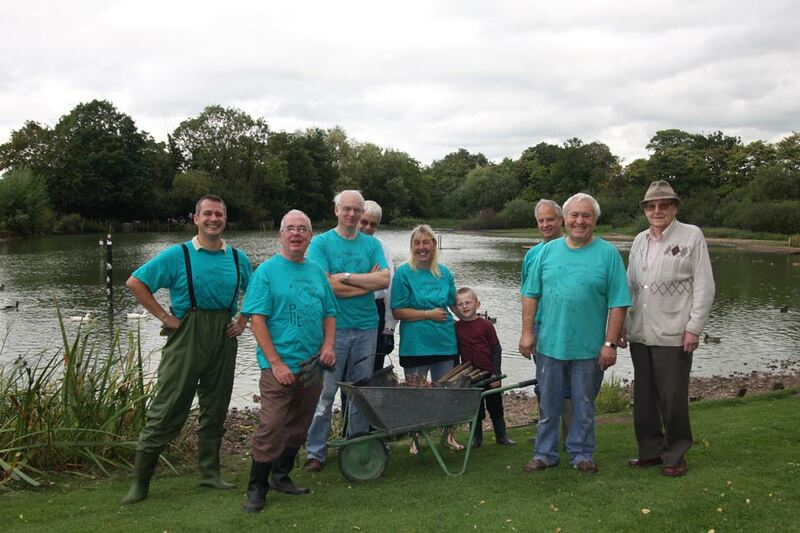 The Christleton Pit project has achieved national status, and our pond was one of ten ponds chosen across the nation to illustrate the conservation value of ponds to other local communities. 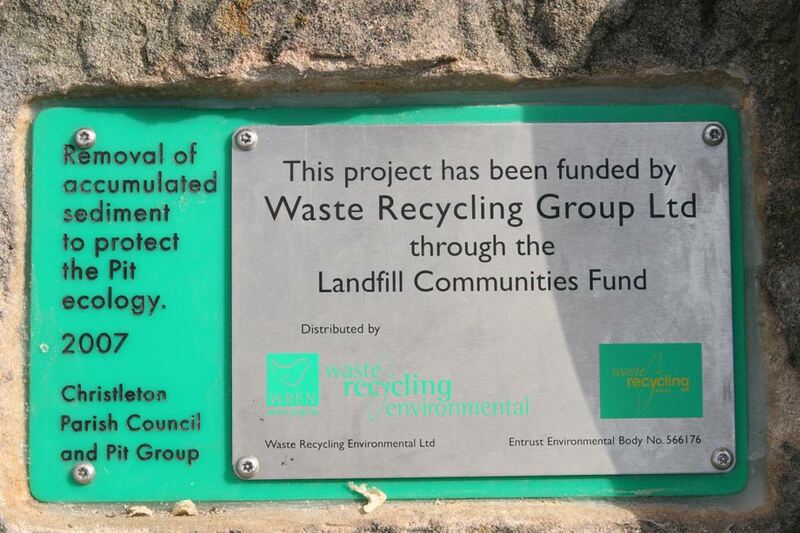 The strength of the Pit Project was that it was the only one that was truly community based, receiving almost no outside assistance from bodies such as the World Wildlife Fund or English Nature. The beautifully illustrated plaque commemorating the event now standing at the edge of the pit was designed by Eric Kenyon and made in nearby Shropshire. The base was cut and built by the team using some York stone, and the chrome ring and fixing designed and made by Ian Gorst. The National scheme was eventually shelved, but the Christleton Project has continued unabated. There is always work to be done, and volunteers are always welcome to join our number and help to keep this superb natural amenity safe for the future, and continue to be of great value to the village and the wider community. 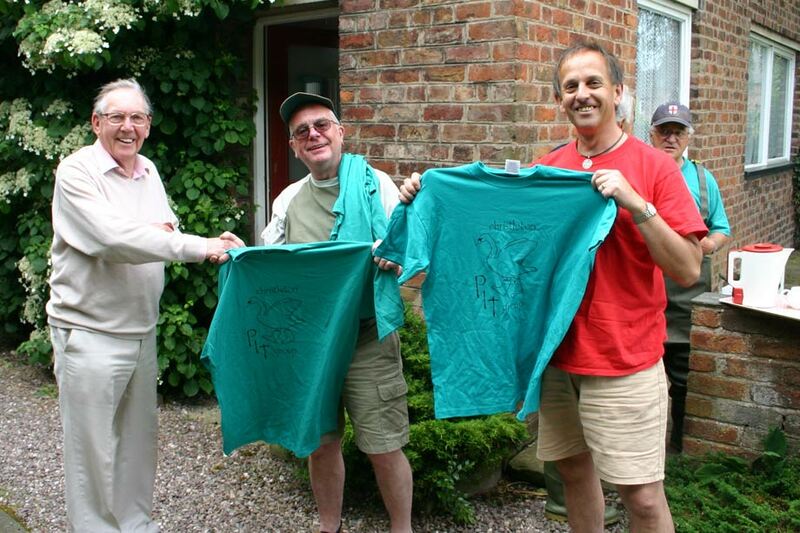 Tony who passed away in January 2012 and his late wife Pat were great supporters of conservation work at The Pit from the efforts of the children from the Primary School in 1976, and latterly with the Christleton Pit Group. They provided refreshments every time we met, including more recently Tony’s special coffee (not for the children of course). It’s been estimated that he produced over 2,000 cups of coffee during this time. We’re not sure how many bottles of rum and whisky were used to warm the coffee!!! But it worked, and the work rate of the team always improved after our coffee break. The sound of ringing from the little bell must have seemed odd to passers by, but pit group workers covered in grime and mud would magically appear from all directions. 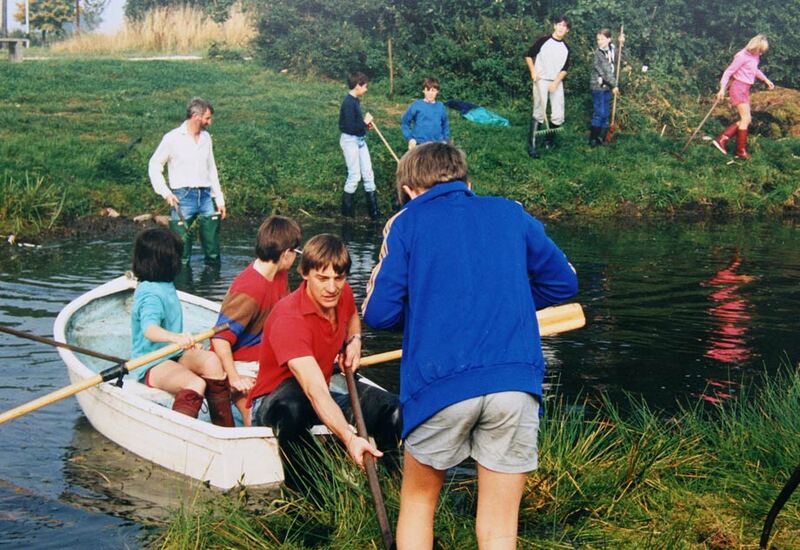 Tony had first been involved in conservation work at the Pit in the 1960’s when the Parish Council led by Dennis Roberts, Phil Heywood, Tony and others tried to kill off the water horse tail plants which were choking the Pit. They used weed killer to spray over the surface, something which would never be allowed today, but they succeeded, and the Parish Council won a Conservation award from Cheshire County Council for their efforts. In Millennium Year he was very proud to be invited to unveil the Commemorative Plaque which stands on the Alms Houses side of the Pit today, to celebrate the efforts of the Village in maintaining the Pit as a Local amenity for all. He worked with Cheshire County Council as an Architect for Planning Issues, working closely with his good friend Phil Haywood on many aspects of the environment connected with the village, especially tree planting etc. He was also involved at the time when Christleton became a Conservation area. He was Chairman of the Parish Council for six years, and was in the Chair in 1985, when the issues of the proposed new A55 extension through the village, was announced. He was one of the founders of Churches Together in Christleton, acted as secretary for many years, and was a staunch member of the congregation at St James. He was a very happy family man with three children and several grandchildren. Tony was a real gentle – man, with such a wonderful smile & delightful personality. He never complained about his various illnesses and ailments, and was still positive about life, and all he could possibly enjoy. He was also a very good friend to many in the village and he will be sadly missed.